In a word: Better than average, expected, or deserved. Cameron ate the PineApple pork express with chips. 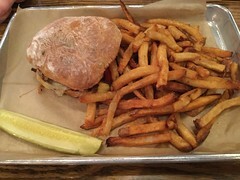 David ate the Cubano with fries. JM ate the white cap beef with chips. 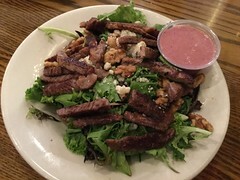 Nichole ate the steak salad. The bill was about $11/person plus tip. Cameron, David, JM, and Nichole gave Roast an A- (see our grading rubric). There are a lot of old-school naming conventions on display in Madison. On the west side we have a Tied House and a Free House. 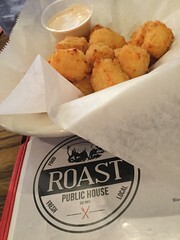 And here on State Street we have Roast Public House. You know, a pub. In fact, we're reasonably sure at one point this was The Pub. But the roast thing is about roasting food, not coffee or beer (nothing JM likes more than a big glass of roast beer), so we knew to expect well-made pub food, but even at this, Roast excelled. We started with an order of cheese curds which still had enough squeak for us to determine that they were not cheese cubes, which their shape had implied. They were served with a chipotle mayo that was serviceable without being showy. Our sandwiches were all well-prepared, though a couple had some flaws worth considering. The PineApple Pork Express was a nice hearty pork sandwich, but pineapple chunks are for pizza, not sammies. A nice ring of pineapple would work much the same way tomatoes do. The sriracha also didn't add much. (Memo to menu planner: sometime sriracha is a nice spiciness to add, other times folks will use the bottle too add it as they see fit, still other times: just stop). 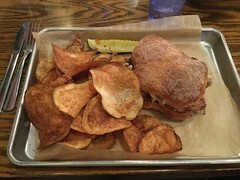 The cubano was mighty tasty, but no mustard. No mustard? What? 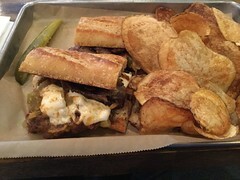 JM's white cap beef was an exemplary sandwich and he had not found its equal in Madison yet. It's a beef sandwich with mushrooms and melty cheese. Most beef sandwiches are trying to be something else: a Philly, an Italian beef, a French dip. Those are bound by too much law to be as filled with grace as this one. It was really good. Nichole got a salad, even the smaller portion of which was substantial, and the beef on top was some of the tastiest in memory. Good to have a salad that's as thoughtfully put together as this. Nichole and David were both very happy with their simple mugs of nicely roasted coffee. Everything we ate ranged from above average to really, really good, even if there were a few hiccups in the menu planning phase. Roast is the kind of place you could pop in for a weekday lunch or a relaxed date dinner. Plus, the service was attentive without being too involved. Also, congratulations to David, who holds the record for longest gap between A to Z meals. He last went with us to China Buffet (#00078) for a total gap of 955 restaurants and 4281 days. Good job!